Ostrowski Landscaping & Lawn Care, LLC has provided services such as lawn maintenance, lawn installation, landscaping and landscape design, and retaining wall installation to residential and commercial customers in Central Wisconsin for over 15 years. Our business has been outstanding thanks to a steady flow of referrals from a large base of satisfied customers. That’s what happens when you are passionate about what you do and take care of your clients. Our customer testimonials will attest that we provide premium quality work at lower prices than many of our competitors. 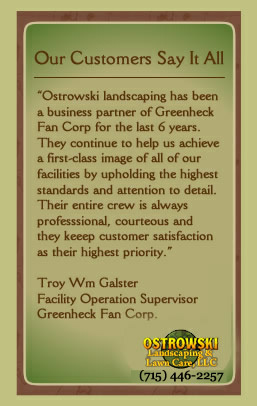 Ostrowski Landscaping & Lawn Care, LLC is in your area offering regular lawn care and maintenance. Comprehensive services are available with great package prices. Talk to your neighbors and ask about our neighborhood discounts! We are on time every time using well-maintained equipment; we are fully insured and guarantee 100% satisfaction. Give us your email if you would like to be informed of any special / seasonal discounts on design or maintenance services. Call now! Maintenance and design is in high demand and schedules are filling fast! Don’t see a lawn, landscape or snowplow service you need.